On this page, you'll find instructions telling you how to find "open images" (images you can use without permission from the author/creator) on a few common image sites, and how to figure out what kinds of attributions or citations you need to use. Note that this page may be difficult to understand without reading the previous page on this guide, "Understanding Copyright." We suggest that you read that page first if you are not familiar with Creative Common licenses or do not know how to tell whether something is in the public domain. Enter your search term, and click Search. On the results screen, click Search Tools below the search box. Select Labeled for Reuse in the Usage Rights drop-down menu. Click on EACH IMAGE that you'd like to use. Click on the Visit Page button next to the image. 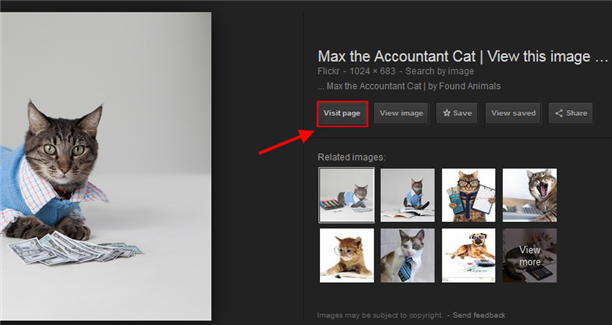 You will need to skim the resulting page to find the license for the image. If it is on Flickr, it will be in the lower right-hand corner of the screen. Otherwise, skim the page for the words "license," "Public Domain," or "CC." You may also see one or more of the Creative Commons symbols (for more on these, see our Copyright page on this guide). Click on the Any License drop-down menu. Select All Creative Commons to see images with a range of different permissions, or select the specific kind of permission you need. Select U.S. Government works for images in the public domain. 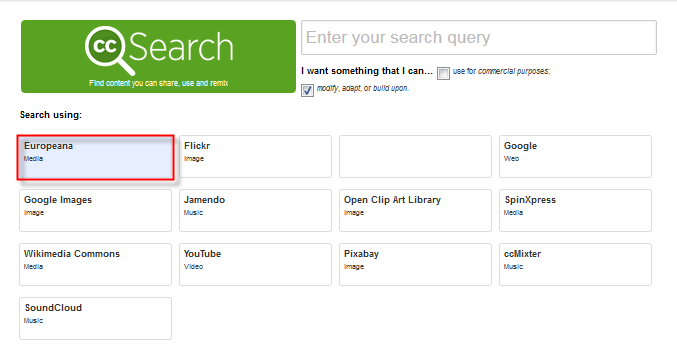 Search for images, and click on the ones you want to use. License information will be in the lower right-hand corner of the screen. If the license is a Creative Commons license, like the one above, first find the name of the owner or artist (in Flickr this will be on the lower left-side of the screen). Then go back to the lefthand portion of the screen, where the license information is. 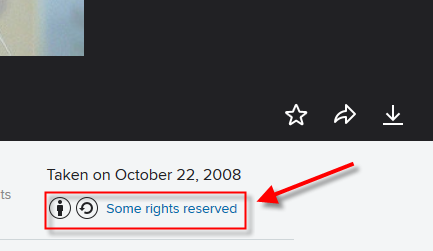 Click on the link next to the Creative Commons symbols (it will say something like "Some Rights Reserved). You will be taken to a page which lists the terms of the license. In most cases it will require you to give credit to the owner of the image and to link to the terms of the license (the same page you should be on when reading the terms of the license). Go to the Creative Commons Beta to search a wide range of open images, music, sound effects, and video. Pay attention to the options below the search box. You can choose to search for media that is legal to modify and reuse, or that is legal to use for commercial purposes. If you are looking for something to use in class, you should uncheck both of those options: they will make your pool of results a lot smaller. Select a site to search from (in the screenshot below you can see that we've selected Europeana). The Creative Commons search does not actually curate images or any other kind of media--it searches your selected site for items in the public domain or under a Creative Commons license. 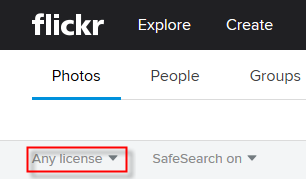 You can always search these sites from their own interfaces, but the CC search may be better at searching for license information in some cases. Once you've found an image or video you'd like to use, you must examine it and determine what license it is under and what kind of reuse rights it allows. Click on the image and search the page for words like "license," "public domain," or "CC." Remember that even if something is under a Creative Commons license, these licenses are not all the same. To understand what your responsibilities are when you use media that is under a Creative Commons license, see our Copyright page on this guide.